some notes on 2nd cycle / 2nd winter plumage. In the complete moult during the summer, 2CY marinus (like all large white headed gulls) replace wing-coverts, tertials and flight feathers. In the July and August sections the progress of this complete moult is illustrated. After completion of this moult, all flight feathers (primaries, secondaries and tail-feathers) are new, 2nd generation and fresh again. This annual moult is necessary, as the primaries were already very worn by May and needed replacement. 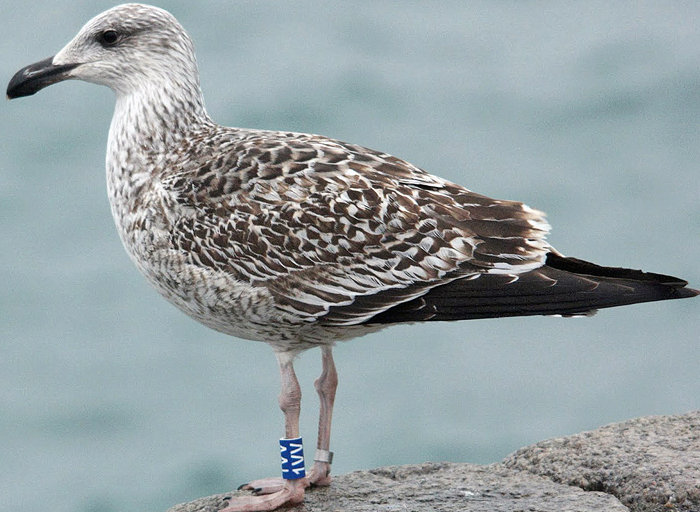 Larus marinus 1VV 1st cycle (2CY), January 18 2014, Bullock Harbour, Ireland (Graham Prole). 1st cycle / 1st winter bird. Classic view of tertials and wing-coverts: all remain juvenile until the start of the complete moult in May of the 2nd calendar year (2CY). In this bird, few rear scapulars remain juvenile as well, while upper scapulars have been replaced for 2nd gen feathers. 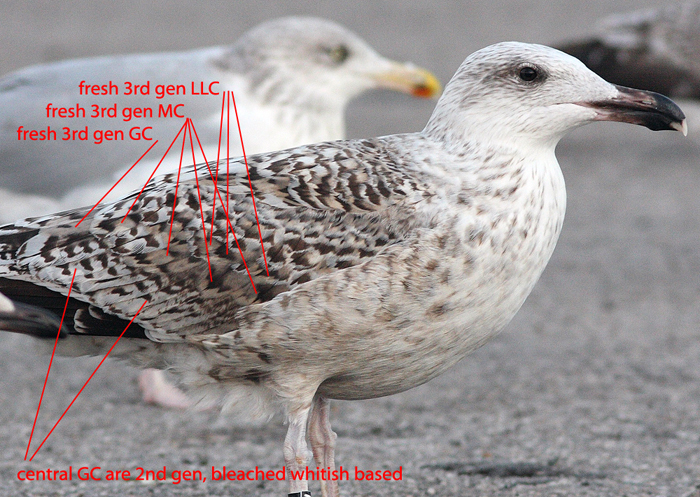 Larus marinus 1VV moulting into 2nd cycle (2CY), August 03 2014, Bulloch Harbour, Ireland (Graham Prole). In April-May the innermost primary P1 is dropped and this is the start of the complete moult in summer. By August, birds are replacing the outer primaries for 2nd generation, but (nearly) all wing-coverts and tertials are replaced; now they are fresh again, new 2nd generation feathers with bold barred patterns. The fresh feathers often show buffish of greyish tones, and neat buffish fringes. The fringes of the coverts bleach to white in about a month, when feathers become older. Here: P6 is already full grown, and the old juvenile P10 is still present. Also active moult in rectrices, with last old juvenile tail-feather still present (probably R5). 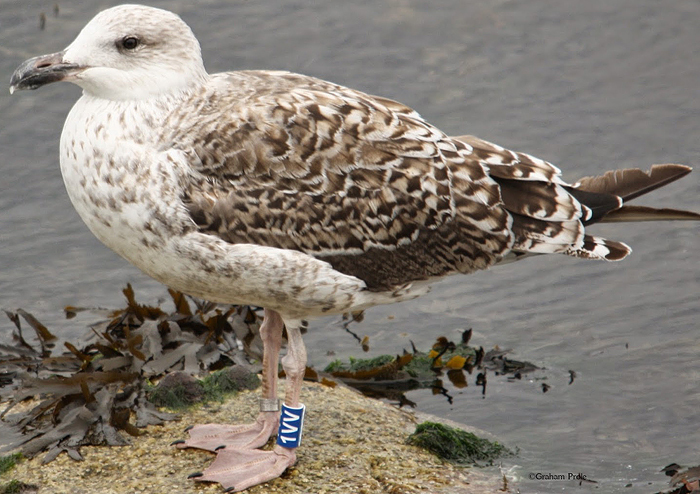 Larus marinus 1VV 2nd cycle (3CY), February 17 2015, Dalkey, Dublin, Ireland. Picture: Stephen Lawlor. Compare to the plumage in August, when all wing-coverts and tertials were replaced for 2nd gen feathers in the complete moult. A subsequent moult in fall "partial autumn moult" has included the upper tertials and some inner wing-coverts to be replaced again, now for 3rd gen feathers which appear fresher and different in pattern, contrasting to the older 2nd gen adjacent feathers. TT1-2 (arrow 1) are 3rd generation, while TT3-6 are remained old 2nd gen, GC1-3 are new (arrow 2), MC2,6,8,9,11 (arrow 3), LLC3,4,8,10, (arrow 4) and about 4x LC have been replaced for 3rd gen feathers. By August, the complete moult in the wing-coverts is finished with replacement of the last central greater coverts and finally the feathers in the carpal edge (very small outer lesser coverts). As those last lesser coverts are replaced for second generation feathers, the partial autumn moult starts in many 2CY marinus, starting again with the upper tertials and some median coverts. By September, many 2CY marinus are in active partial moult again; a moult cycle that overlaps with the last stage of primary moult (which is part of the complete moult cycle). In most individuals, the partial autumn moult is only very limited, but may vary between individuals, and may have some relation with day time length on wintering location or hatching latitude (less advanced partial autumn moult in northern birds?). Commonly the upper tertials (upper TT) and a variable number of wing-coverts is replaced again, normally a handful of median coverts (MC). This moult stage can be found commonly in late August but may be found in late September birds as well. 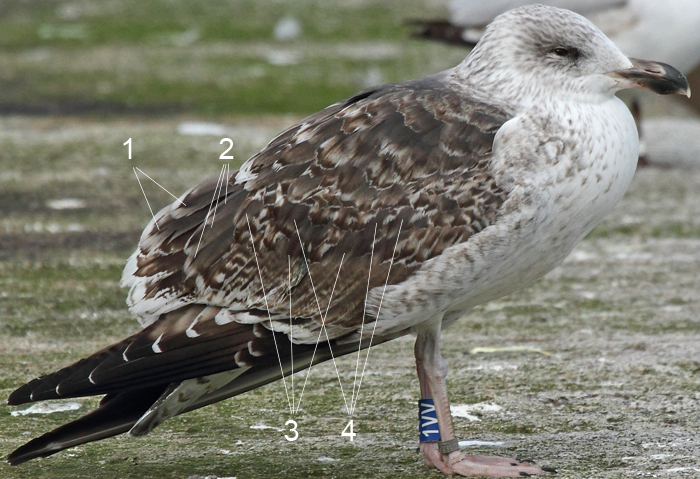 Most extensive moult takes place in the median coverts (MC) and lower lesser coverts (LLC). Moult in the greater coverts is often confined to the inner feathers and moult in the tertials is often confined to the upper three feathers. 2CY marinus hardly replace lesser coverts, and if they do, there seems to be no determined sequence. By October most 2CY birds have the innermost greater coverts, most of the median and lower lesser coverts replaced. 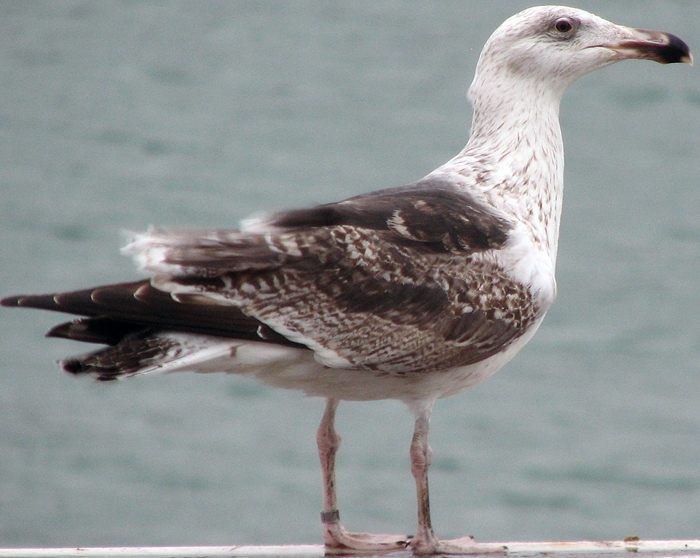 The upper tertails are included in this partial moult as well. The final extend of the partial moult is reached by late-October, when birds have the moult gaps closed again and will be ready for winter. Great Black-backed Gull (Larus marinus) JK37 2nd cycle (2CY), September 24 2007, Boulogne sur Mer, France (Jean-Michel Sauvage). 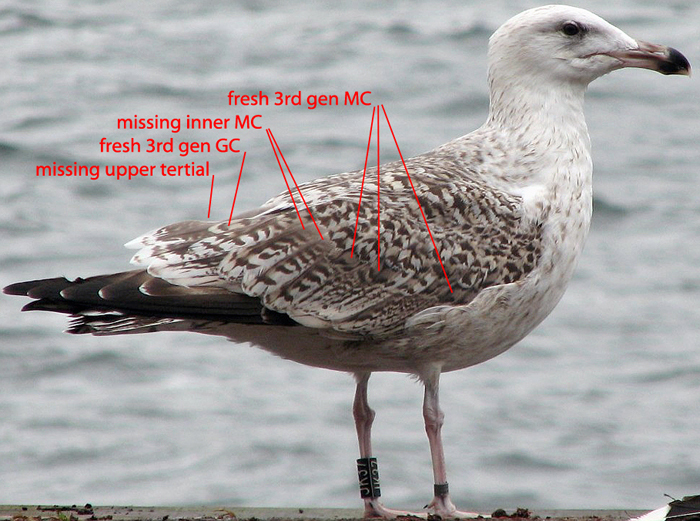 Active partial autumn moult, missing TT1, new inner GC, several new MC but also some MC missing. P9 is fully grown and P10 still growing. Great Black-backed Gull (marinus) J713W 2nd cycle (2CY), September 24 2012, Boulogne-sur-Mer, France (Jean-Michel Sauvage). Typical pattern of partial autumn moult, replaced are upper TT, inner GC, most visible MC and randomly some LLC and LC. The new 3rd gen feathers have buffish tones and very neat fringes as they were very recently replaced. The older 2nd gen MC and LLC were already replaced in June, and the buff tones have bleached to white on these older feathers. The pattern of the new 3rd gen coverts and tertials vary from plain adult-like grey feathers (like in 1VV) to feathers hardly distinguishable from the old second generation feathers (like in J713W). In J713W, feathers show a anchor pattern or barred pattern (dark brown to blackish) with a pronounced dark broad shaft-streak on a warm brown base (but the brown tone of these feathers will bleach to almost white with time). Some birds show intermediate patterns: plain grey base of the feather with a brownish upper half, anchor pattern and clear white fringe. 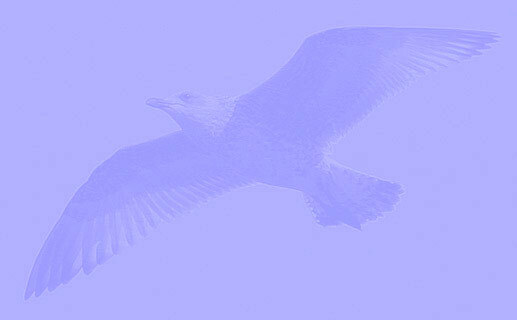 After completion of the partial moult, some birds may look advanced and similar to some retarded 3rd cycle birds. See below for J0658 from Britain and JH617 from Norway. Despite JH713 being one moult cycle ahead, both birds have plain blackish feathers in the scapulars, dark upper tertials, inner greater coverts, and many median coverts. Great Black-backed Gull (Larus marinus) BTO J0658 2nd cycle (3CY), February 27 2007, Boulogne-sur-Mer, France (Jean-Michel Sauvage). Advanced plumage, with dark saddle and blackish 3rd gen MC. Great Black-backed Gull (Larus marinus) JH617 3rd cycle (3CY), October 04 2013, Boulogne-sur-Mer, France (Jean-Michel Sauvage). This bird is one moult cycle ahead of BTO J0658, however quite similar in general appearance. Best clue are the flight feathers: 2nd gen primaries and rectrices in BTO J0658 but 3rd gen flight feathers in JH617. Great Black-backed Gull (Larus marinus) 3cy BTO 0658 February 27 2007, Boulogne / Mer, France. Picture Jean Michel Sauvage. 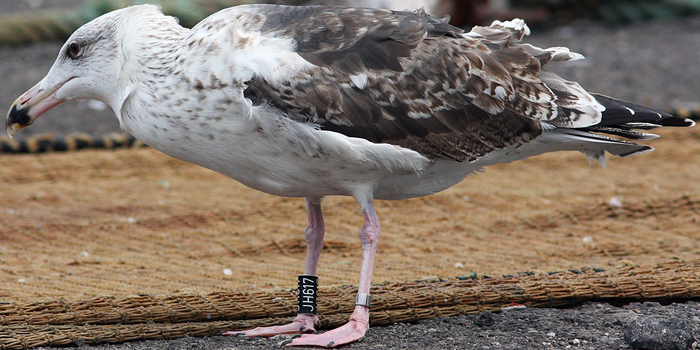 Great Black-backed Gull (Larus marinus) JH688 3CY, February 23-27 & November 19 2015, Scheveningen, the Netherlands. Great Black-backed Gull (Larus marinus) JT742 3CY, February 12 2016, Terschelling, The Netherlands. Picture: Jacon Jan de Vries. Great Black-backed Gull (Larus marinus) JU161 1CY-3CY, December 2014 - February 2016, IJmuiden, the Netherlands. Great Black-backed Gull (Larus marinus) JZ413 2CY-3CY, February & November 2015 & February & December 2016, IJmuiden, the Netherlands. Great Black-backed Gull (Larus marinus) HLJ3 3cy, February 24 2016, IJmuiden, the Netherlands. Great Black-backed Gull (Larus marinus) 2nd cycle (3CY), February 24 2016, IJmuiden, the Netherlands. Great Black-backed Gull (Larus marinus) 3CY, February 27 2015, Scheveningen, the Netherlands. Great Black-backed Gull (Larus marinus) 3cy, February 02 2012, IJmuiden, the Netherlands. Great Black-backed Gull (Larus marinus) 3cy, February 19 2015, IJmuiden, the Netherlands.